If asked to describe a perfect vacation, I'm sure many women, and an increasing number of men, would include a spa experience as part of their ideal getaway. Over the years, Canyon Ranch has come to epitomize the gold standard of Spas. 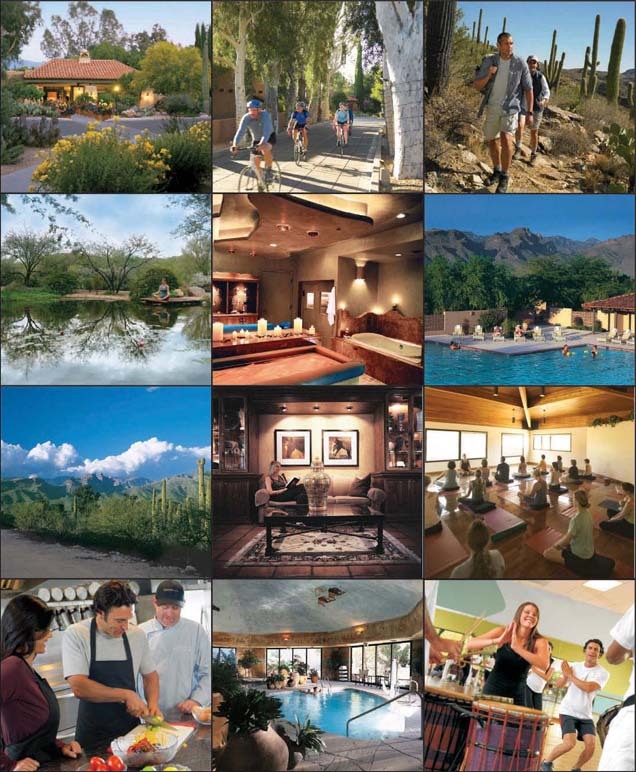 Among the reasons for this one should look to the Canyon Ranch founder, Mel Zuckerman, who welcomes his guests with the message, "It is our sincere desire that your Canyon Ranch stay be relaxing, energizing, peaceful, enlightening, challenging, restorative � the possibilities are endless. Consider the extraordinary opportunity that your stay offers for lasting life change � allow yourself time for contemplation � here you have the chance to go within and make an emotional connection between how you know you should live your life, and how you actually do." During our recent stay at the original Canyon Ranch in Tucson, Arizona we were shown a pathway to become healthier, more focused on our daily activities and more in touch with conscious choices determining what is meaningful to us personally. The Canyon Ranch personnel help create the optimum schedule for one's entire stay and the guest speakers help motivate one to action. If you need information about a disease, health issues, preventive or integrative physician consultations, someone will address that. How about sharpening your memory, learning to relax, stress management or learning to cook and eat healthy? Yes, yes, yes and my goodness yes. 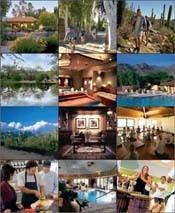 Golf clinics, hikes, the ideal exercise regime � even delving into spirituality, the metaphysical world, sexuality and intimacy are but a few of the items on the Canyon Ranch menu from which you can choose. This is a world class facility with a state of the art Spa, three gourmet meals a day, scenic surroundings and gracious Southwest style accommodations. Lectures we attended included: Ten Steps to Cancer Risk reduction, Spiritual Anchoring in Turbulent Times, Optimizing Joint Health, Straight from the Heart [how to understand and deal with all heart related issues], Improve Your Memory Power, The Science of Weight Loss, Gemstones & Diamonds. There were so many more that, given the time, we would have liked to attend. There were always worthwhile takeaway ideas from these sessions, some obvious, others enlightening. For example, if you have an idea to change a particular behavior, within the first 30 seconds you have an 80% chance of success but after 60 seconds that drops to a 20% success rate. Be aware of when you are reacting rather than responding. Reacting is based on triggers. Responding is being more present in the moment. If at peace give thanks. Have an attitude for gratitude and find ways in your own life for this. Have a spiritual practice, be it prayer, meditation, gardening, whatever works for you. Find ways to serve. There is a joy in helping your community and other people. Wean yourself of gloom and doom. The Canyon Ranch experience is not merely a bunch of slogans but practical suggestions, advice and plans for each of us to be in touch with our physical and emotional needs and be motivated to achieve them. You can have a variety of spa treatments including a myriad of massages, meet some interesting people, indulge in the scrumptious and healthy gourmet meals, take steps to reduce your stress levels and find a balance that makes you feel a bit more serene and healthy. There are over forty indoor and outdoor fitness activities from which to choose, including hiking and biking through the Sonoran Desert, yoga, zumba, strength training, cardio and weight loss exercises, pilates, aqua aerobics and dance at various difficulty levels, just to mention a few. Our only regret was not having more time to spend at Canyon Ranch as there was so much more to do! Visit www.canyonranch.com to learn more.